Tech.Co invites innovative early-stage startups to participate in online regional Tech.Co Startup of the Year competitions. Ann Diab presents some eligibility criteria. Product Hunt aims to establish closer cooperation with entrepreneurs in Kansas City. More information on Startland. Tech In Asia has raised USD 4 million. According to Jon Russell, it is the biggest investment in an Asian tech media company so far. He presents Tech in Asia and explains what its recent success means for Asia’s tech community on TechCrunch. In the Forbes Magazine, Alison Coleman presents Top 5 innovation hotspots in Europe: (1) Eindhoven, Netherlands, (2) Budapest, Hungary, (3) Lithuania, (4) Tallinn, Estonia, and (5) Lisbon, Portugal. Mapme, an Israeli startup, has raised USD 1 million. It will be invested in developing its mapping system in the country and abroad. More information in B. Shane Morganstein’s article on Shalom Life. Naya Ventures, US, is about to close its second USD 100 million fund and launch a new incubator programme. It is also trying to attract more investment from other local venture capitalists. Danielle Abril gives more details in Dallas Business Journal. In the Entrepreneur magazine, Nate Good gives 4 tips on how startups can compete with big companies in attracting talented people. EIT Digital, an innovation organisation run by the European Institute of Innovation and Technology (EIT), has launched the 2nd Idea Challenge competition. It aims to find the 24 most innovative startups in Europe. The application deadline is 6 July 2015. More information can be found on ArcticStartup. In Seattle, the University of Washington and Tsinghua University are going to establish a science and technology-focused academic institute, the Global Innovation Exchange (GIX). One of its founding partners is Microsoft. It has already invested USD 40 million in the project. Sean Dudley provides more details on OnWindows. Nesta, an innovation charity, Future Cities Catapult, a smart cities organisation, UK, and Accenture, a management consultancy firm, have released the CITIE: City Initiatives for Technology, Innovation and Entrepreneurship report. It has compared the quality of city policymaking on entrepreneurship in 40 cities around the world. It has concluded that the best work conditions for entrepreneurs, especially for those working on innovative tech projects, are in New York, London, Helsinki, Barcelona and Amsterdam. Natasha Lomas presents some report results on TechCrunch. The author of the text is Birute Birgelyte, PR and Communications Trainee at Startup Commons. You are free to re-edit and repost this in your own blog or other use under Creative Commons Attribution 3.0 License terms by giving credit with a link to www.startupcommons.org and the original post. Photo credit: ebayink. The photo was originally published on Flickr. It has been used to illustrate this text under Creative Commons Attribution 2.0 License terms. No changes have been made. National and local governments around the world often struggle to design and implement new policies to foster the creation of new firms. The rationale is that small- and medium-sized enterprises (SMEs) are engines of labor creation. For example, in the U.S., according to the Census Bureau, SMEs employ about half of the labor force. This share is typically higher in developing nations. Nowadays, some of these policies focus on hi-tech start-ups. Start-ups can not only create employment in the medium run, but can also innovate and push the world’s technology frontier further. Furthermore, some would claim that the externalities generated in a vibrant start-up environment would justify a market intervention. But, how do you get the entrepreneurship ball rolling in a developing country? Clearly, limited financing is an important market failure that keeps small firms from emerging more frequently in developing countries. Volatility and weak institutions in developing nations imply lending risks are high even for large and already established firms. Entrepreneurs often lack collateral or other guarantees required by formal lending institutions. On the other hand, equity investors could make sizeable profits by hedging funds in several start-ups. It’s a classic “chicken-and-egg” problem: Lack of financing constrains the cultivation of entrepreneurs, and without entrepreneurs there are not enough hedging opportunities to attract investors. This “failure,” together with the possible externalities that the existence of these start-ups could generate, could be a good enough reason to justify government intervention. But, what is the optimal policy here? There are two possibilities: Fund the firms or fund the funds. The former implies the government could act as an investor in the market by selecting and investing in new start-ups. This is one way the government could share a big chunk of the aggregated risk. This, in turn, could attract private investors to also join the game once there is enough deal flow (i.e. a big enough mass of start-ups waiting to be financed). The latter actually implies that the government would invest in venture capital funds, incubators and accelerators which will be the ones selecting and investing in new firms. This is another way for the government to share the risk with the private investors, thus solving the supply problem. Yozma, a fund of funds established by the Israeli government and later privatized, is an example of how this policy can be made to work (you can read more on the Israeli innovation ecosystem here). Which policy is the right one? It is an open debate. Critics of “funding the firms” would say that the government incapable of deciding which firms should be funded and which should not, and such a policy generates risks of rent-seeking and corruption. They would claim that the private sector would do a much better job of selecting projects to invest in, and therefore “funding the funds” is the better approach. However, “funding the funds” is also problematic: The government would be subsidizing already wealthy investors, possibly crowding out some private investment. All in all, both policies face a common issue: Taxpayers do not directly benefit, at least in the short run, from either strategy. As resources are limited, particularly in developing countries, it can be highly unpopular for a government to devote public resources to innovation and not to more pressing social issues. But at the same time failing to do so will keep us on our current path of increasing inequality between rich and poor countries. Policymakers understand this, and that is the reason innovation policies are becoming more and more important in the agenda for many governments in developing nations. Financing, though, is only one of the elements required for a vibrant entrepreneurial environment. The more we see governments tackling the innovation conundrum, the more evidence we will be able to document, thus getting us closer to finding the right policy mix that will boost entrepreneurship and innovation in developing countries. The author of the text is Dany Bahar, (@dany_bahar), PhD, Nonresident Fellow at the Brookings Institution’s Global Economy and Development program. It was originally published at http://www.brookings.edu/blogs/up-front/posts/2015/05/20-innovation-policy-conundrum-developing-countries-bahar by The Brookings Institution. All rights reserved by The Brookings Institution. Photo credit: Boegh. The photo was originally published on Flickr. It has been used to illustrate this text under Creative Commons Attribution 2.0 License terms. No changes have been made. IBM and Boris Johnson, Mayor of London, have launched a new project: Tech.London. It is a website which will present news and updated information on local tech startups, investment opportunities, incubator and coworking spaces as well as startup events and activities. Find out more about the project in Roland Moore-Colyer’s article on VC3.co.uk. Google is going to support first-time startup founders over 50 in its Campus London accelerator. Sam Shead interviews Sarah Drinkwater, Head of Campus, about the initiative on Techworld. On 15 June the International Finance Corporation (IFC) hosted the Innovation Marketplace event in Istanbul. Temur Tatishvili gives an event report in The FINANCIAL. On the same day, William Xu, Chief Strategy Marketing Officer at Huawei, announced the company’s decision to accelerate industrial digitisation in Europe in cooperation with its European partners at the 3rd Huawei Innovation Day in Munich. More information in Huawei’s press release published in the Parliament Magazine. On 23 June David K. Hurst will conduct a webinar on business innovation, organised by the Conference Board of Canada. Rick Spence reviews the agenda in the Financial Post. SixThirty, a fintech accelerator based in St. Louis, has announced a call for applications for its Fall 2015 Cohort. The application deadline is 10 July 2015. Drew Thompson introduces the programme and the SixThirty team on Nibletz. The UK is the leader in female entrepreneurship in the world: 30% of British entrepreneurs are women. In the opinion of Ann Pickering, HR Director at O2 Telefónica UK, British competitiveness could be even better if more attention was paid to gender stereotypes. She explains her point of view on City A.M.
TechStars, an international startup accelerator, has acquired UP Global, an NGO known for Startup Weekend and Startup Week events as well as Startup Next, an accelerator, and Startup Digest, a personalised startup newsletter. Duncan Riley provides more details about the acquisition on SiliconANGLE. On Tech in Asia Anh-Minh Do shares the success story of Launch, a Facebook group which has become one of the main networking and startup news sites for Vietnam’s startup community. Microsoft has revised its BizSpark Plus partner programme and announced that Sw7, an accelerator based in Rivonia, South Africa, will be its partner in Africa. The programme will be launched on 1 July 2015. Tom Jackson explains Microsoft’s decision on Disrupt Africa. For more news, see also Startup News Review, 12 June 2015. The author of the text is Birute Birgelyte, PR and Communications Trainee at Startup Commons. You are free to re-edit and repost this in your own blog or other use under Creative Commons Attribution 3.0 License terms by giving credit with a link to www.startupcommons.org and the original post. Photo credit: Nick Kenrick. The photo was originally published on Flickr. It has been used to illustrate this text under Creative Commons Attribution 2.0 License terms. No changes have been made. Other investors also acknowledged achievements of Lithuanian entrepreneurs. “The Lithuanian startup ecosystem could be described in these five words: technical, perseverance, networkers, community, underserved,” shared Linus Dahg, Associate of Wellington Partners, UK. Yanki Margalit, social entrepreneur and investor from Israel, evaluated the projects presented at the fair even simpler: “Less marketing and more content.” Both of them agreed that Lithuania deserves more international attention (startuplithuania.lt, 2015). This text is a step in this direction: it will present 5 facts about Lithuania which entrepreneurs and investors looking for new business opportunities should be aware of. Fact 1: Lithuania’s competitiveness index is improving very fast. In the 2015 IMD World Competitiveness ranking of 61 selected countries, it ranks 28th. It is a 6-position improvement since last year. This is the best Lithuania’s result so far as well as the best performance in the region this year. Estonia has declined by 1 position to the 31st, Poland has moved up by 3 positions to the 33rd, Latvia has declined by 8 positions to the 43rd. Lithuania has improved its competitiveness index in 6 categories: (1) by 7 positions in the economic growth category (from 44 in 2014 to 37 in 2015), (2) by 12 positions in the business effectiveness category (from 35 to 23), (3) by 13 positions in the availability of risk capital category (from 24 to 11), (4) by 8 positions in the international investment category (from 49 to 41), (5) by 7 positions in the government efficiency category (from 32 to 25) and (6) by 15 positions in the ease of doing business category (from 32 to 17) (startuplithuania.lt, 2015). Fact 2: “2014 was a record year for Lithuanian startups". This is how Enterprise Lithuania (2015) has summarised the results of the Startup Lithuania 2014 survey, which has evaluated the performance of 52 innovative IT startups. Last year they attracted EUR 46 million in investment, had 405 employees and paid over EUR 2 million in tax in total. In 2013 these figures were much lower: there were EUR 34 million in investment, over 200 employees and approx. EUR 0.5 million tax. In addition, 2014 marks some other positive changes: branches of Game Insight, WIX, Uber were established, the game industry was developing successfully and a life sciences startup ecosystem project was launched. For more information on the achievements of the Lithuanian startup community last year, please see the survey overview. Fact 3: On 10 June the Sunrise Valley Centre for Technology and Innovation was officially opened. It is part of the Science and Technology Park (STP) of the Institute of Physics, Vilnius, which conducts research and experiments in applied sciences and facilitates integration of science and business by assisting enterprises in commercialising research results and coordinating activities of the Laser & Engineering Technologies Cluster (LITEK) (STP, 2015; litek.lt, 2012). The Centre for Technology and Innovation has already accepted 23 high-tech companies such as Ekspla, a laser technology company, Ferentis, a biotechnology company, as well as some companies specialising in optoelectronics, nanotechnology and bioengineering. In addition, the Centre complex has a modern laser centre and nanoengineering laboratory (Neverauskas, 2015). Fact 4: Lithuania has one of the best Internet upload and download speeds in the world (Mančas, 2015). In the Ookla Household Upload Index, Lithuania is 5th with a 52.02 Mbps upload speed. It is the highest position in Europe. The EU average upload speed is 11.1 Mbps. In the Ookla Household Download Index, Lithuania’s result is also very high: it has been ranked 8th with a 57.93 Mbps download speed. It is the 3rd best European performance after Romania (5th position, 71.93 Mbps) and Sweden (6th position, 60.49 Mbps). The EU average download speed is 31.4 Mbps (16 June 2015 data). Fact 5: Lithuanians are among the best educated European nations (Mančas, 2015). The 2011 Population and Housing Census by Statistics Lithuania shows that “one in five Lithuanian residents has a university degree”. The best educated age group are 20–29 year olds: 22.8% of them have higher education (The Lithuania Tribune, 2013). The 2012 Eurostat European Adult Education Survey (ADS), conducted in all the EU member states, also confirms that the Lithuanian society gives a lot of attention to professional qualifications. More than 75% of 20–24 year old local students enrolled in universities and colleges in the academic year 2011/12. 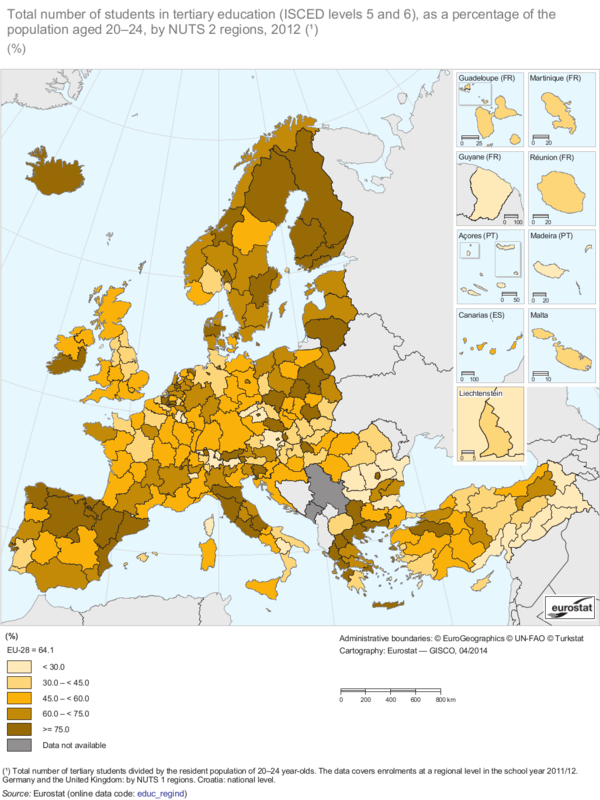 The EU average enrolment rate was 64.1%. For more information on business opportunities in Lithuania, please visit the websites of Enterprise Lithuania and Startup Lithuania. The author of the text is Birute Birgelyte, PR and Communications Trainee at Startup Commons. You are free to re-edit and repost this in your own blog or other use under Creative Commons Attribution 3.0 License terms by giving credit with a link to www.startupcommons.org and the original post. Larry Alton, an independent business consultant, gives tips on setting up a startup pension plan on Business 2 Community. Keith Jones, Cofounder of Sw7, an accelerator based in Rivonia, South Africa, explains Africa’s tech innovation ecosystem on Disrupt Africa. Between 10–11 June Halifax, Canada, hosted the 3rd Atlantic Venture Forum. Peter Moreira presents the event in The Chronicle Herald. On 11 June the White House and the U.S. Small Business Administration (SBA) launched the Startup in a Day initiative. More information in Ronald Barba’s report on Tech.co. “Startups have under 4 minutes to convince investors”, a new study of DocSend, a file-sharing startup from San Francisco, and Harvard Business School shows. Brian Feldt reviews other study results in St. Louis Business Journal. Lisa Chau interviews Deputy Mayor Kajsa Ollongren on the situation of entrepreneurship in Amsterdam on U.S. News & World Report. Andrea Noronha gives some tips on how to market a startup with a USD 0 budget on iamWire. Cogobuy Group, one of the largest e-commerce companies in China, has released a press release on PR Newswire that its INGDAN.com platform for intelligent hardware projects has attracted a lot of attention. Dojo Madness, an eSports startup based in Berlin, has managed to attract a EUR 2 million investment. See Rachel Weber’s report on gamesindustry.biz. Product Hunt has announced on Business Insider that it is going to add games as a new category to its website and app. The author of the text is Birute Birgelyte, PR and Communications Trainee at Startup Commons. You are free to re-edit and repost this in your own blog or other use under Creative Commons Attribution 3.0 License terms by giving credit with a link to www.startupcommons.org and the original post. Photo credit: Jon S. The photo was originally published on Flickr. It has been used to illustrate this text under Creative Commons Attribution 2.0 License terms. No changes have been made. Today, it's not hard to stumble across success stories of companies raising capital in alternative ways. By alternative, we mean not using banks or traditional lenders or even business angels. Since the financial crisis of 2007, anyone starting a business has realised raising capital is one of the hardest tasks and a critical area of the business plan. This demand for alternative funding mechanisms has given a rise to a growing industry already estimated to be worth billions of dollars. According to recent research published by The Economist, in 2014 global investment in fintech reached $12 billion, up from $4 billion a year earlier. In addition, Goldman Sachs estimates that global revenues linked to the growth of fintech could be as high as $4.7 trillion. Taking a step back, it's important to realise that funding is just one (important) piece of the puzzle. In addition to securing capital, there is a myriad of resources, services and environmental factors that are critical to startup development. Timely access to professional services (such as legal, tax, accounting and developers / programmers) plays a positive role for startups to succeed. As a result, today we are witnessing the growth of ecosystems designed to support startups and small enterprises in many cities around the world. In dedicated areas or business hubs, incubators, accelerators and shared office spaces, knowledge sharing and mentor services form networks that support thriving business activity. These groups of experts assist startups and ensure they have access to timely knowledge and information they need, beyond capital requirements. In addition, many governments around the world have rolled out new regulations covering equity crowdfunding or P2P lending and online digital investments. Governments are taking active steps to keep up with innovations in finance by providing frameworks and an environment in which operators and participants can transact safely and efficiently. As startup ecosystems grow, so do the associated services that support them. At this highest level of small enterprise planning, neural networks or sophisticated platforms that monitor and manage them connect all stakeholders in real time and with access to critical business data. By using these networks, it is possible to better plan, measure and drive the growth of startups, identify bottlenecks and better allocate resources to them. This is an edited version of an article originally published at http://www.growadvisors.com/blog/funding-startups-and-keeping-a-track-of-the-bigger-picture by Grow Advisors. You are free to re-edit and re-post it under Creative Commons Attribution 3.0 License terms by giving credit to the author with a link to www.startupcommons.org and the original post. ﻿Photo credit: Pictures of Money,﻿ https://www.cheapfullcoverageautoinsurance.com/. The photo was originally published on Flickr. It has been used to illustrate this text under Creative Commons Attribution 2.0 License terms. No changes have been made.